This was waiting for me on the kitchen table when I woke up Saturday morning. This illustrates one of the reasons I love Dev so much. He knows me very well. 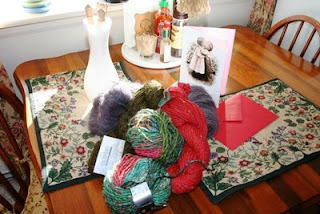 He knew that although I love getting flowers, I love getting yarn even more. The fact that he went to my favorite yarn shop and picked these things out, and that he even remembered to pick up some needles (in sizes I didn't already have), just demonstrates how attentive he is. Sometimes it's hard for me to believe that I ever found someone so wonderful. But I'm so glad I did, and I'm so glad that he loves me. 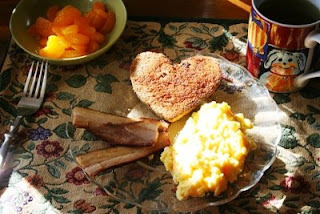 I decided that Valentine's Day breakfast should be a little special, so I made toast in the shape of hearts, AND made bacon. Those of you who read my blog know that we are trying to eat more plant based foods, so meat is a treat for us. Dev actually got bacon for breakfast, pork for lunch and steak for dinner. How's that for a carnivorous Valentine's Day? Here's a shot of breakfast. I didn't take my camera to lunch, nor did I take the time to shoot dinner. I am such a bad blogger.